The introduction of the POWER6 processor-based servers brought to market several advances in server design, performance, and function. One of these enhancements is the capability to virtualize Ethernet within a server. 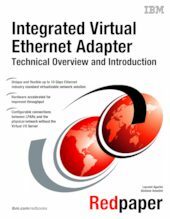 The feature that provides this function is named Integrated Virtual Ethernet adapter (IVE). IVE is the integration of several technologies, including the Host Ethernet Adapter (HEA), advanced software, and updates to the hypervisor, that provide integrated high-speed Ethernet adapter ports with hardware-assisted virtualization capabilities. This IBM Redpaper is for technical professionals interested in understanding the many features of the IVE, and those who configure and support the servers that use it.